I love this stuff! It is the "king of fruits!" Can't wait to get back to Singapore so I can eat them again. NYT: Thailand — You can take the sugar out of soft drinks and the fat from junk food. But eliminate the pungent odor from what may be the world’s smelliest fruit and brace for a major international controversy. 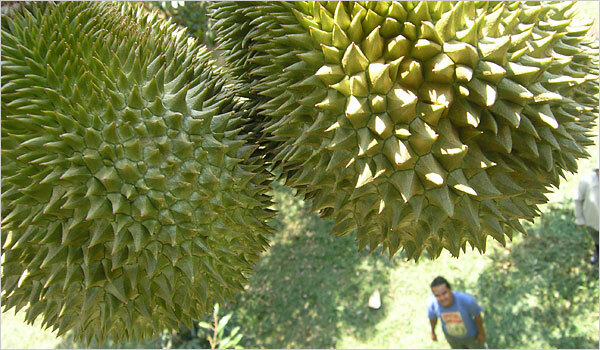 The durian, a spiky fruit native to Southeast Asia, has been variously described by its detractors as smelling like garbage, moldy cheese or rotting fish. It is banned from many hotels, airlines and the Singapore subway. But durian lovers — and there are many, at least in Asia — are convinced that like fine French cheeses, the worse the smell, the better the taste. Under the durian’s hardy shell are sections of pale yellow flesh with a consistency that can be as soft and oozy as custard and a flavor that is nutty and sweet with hints of vanilla and an occasional bitter bite.